Sauté carrots, celery, bell pepper, onion and bok choy until tender, about 5 minutes. 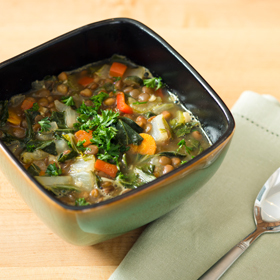 Add lentils and remainder of soup ingredients to sautéed vegetables, reserving parsley. Serving size: 1 cup. Amount per serving: 155 calories, 3g total fat (less than 1g saturated fat), 24g carbohydrates, 10g protein, 8g dietary fiber, 230mg sodium.